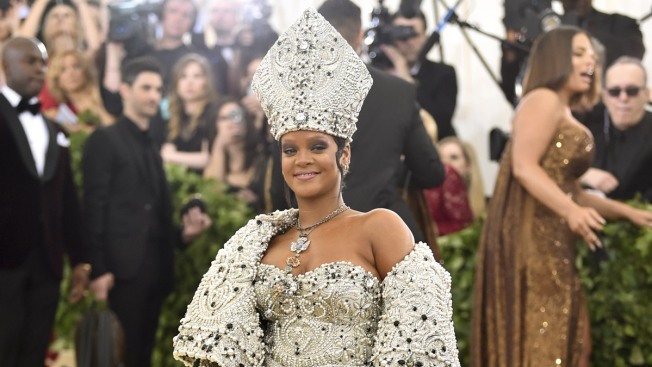 Rihanna attends The Metropolitan Museum of Art's Costume Institute benefit gala celebrating the opening of the Heavenly Bodies: Fashion and the Catholic Imagination exhibition on Monday, May 7, 2018, in New York. A 26-year-old man was arrested on suspicion of breaking into singer Rihanna's Hollywood Hills West home Thursday, the Los Angeles Police Department told NBC News. The pop star, whose given name is Robyn Fenty, was not home at the time of the break-in shortly before 10 a.m., officials said. Police were called when someone spotted an unknown man leaving the residence. It wasn't clear how long the man had been there, but it was possible that he was there overnight, police said. The 26-year-old, whose identity wasn't immediately available, was being booked into LAPD's Hollywood Division Jail.